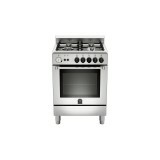 This single-oven cooker has a stamped stainless-steel worktop with 4 burners, including a high-performance triple-ring burner. The electric oven is multifunction and has 9 functions. The cooker features an analogic clock on the fascia. 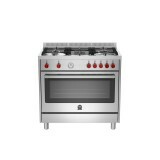 The oven door is triple-glass with a wide extrac..
90cm Free Standing Cooker Stainless Steel 5 Aluminium Burners with Cast iron pan support 1 x Dual Wok Burner & 1 x Rapid Burner 2 x Semi Rapid burners & Auxiliary Burner 1 x 90cm Electric Multifunction oven with electric grill 11 cooking function, 1..